This is, quite simply, the most unusual account of the Holocaust ever penned by one of it's survivors. Though never a victim of the concentration camps, the author's story is yet another chapter in the long list of lives uprooted and forever changed by the war. Only, this story is a bit different. Beginning with the authors luck at having been born into a solidly middle class, secular, German Jewish family, and being able leave Germany just in time, let alone being able to stay together and make a life for themselves in the least expected of places, this story is nothing short of a miracle. The most striking thing about this memoir is that Ms. Bacon was about the same age as Anne Frank during the war. But that is where any similarities in their lives end. Ms. Bacon, as I have said, was born into a solidly middle class German Jewish family. They were secular in their approach to religion, and like many Jews here in America, they even celebrated Christmas. As Hitler's noose began to tighten, the family made plans to leave. But they waited too long, not believeing that any of Hitler's threats would come to pass. And so, in 1939, after having waited a little too long, they were finally allowed to leave, taking with them only the clothes on their backs. And from this point on, the book takes a remarkable turn. It has not been widely written about, but there was a thriving Jewish refugee community in China, notably in Shanghai, during the Second World War. They numbered about 20,000 or so, and the story of how they came to be there is as remarkable as the lives they built for themselves while in Shanghai. The author was an only child. Her father was a printer before all the madness began. Their lives were upper middle class, with the author having a nanny and a tutor. But all that changed when Hitler came to power in 1933, and with the increasingly hostile environment towards even secular Jews rising out of control, the family was forced into exile. They initially left home by rail for Breslau, where they boarded a train for Genoa. From there they caught a German ship to Shanghai, China. This would be their home throughout the war. Speaking no Chinese, and even less English, her parents were somehow able to tap into the refugee community, where they receive their first "housing." In a disease ridden slum dwelling the family resolves, within days of landing there, that they can, and must, do better if they are to survive. With the help of a Chinese acquaintance, Vati, the author's father, is able to go into the painting business, where he does quite well, employing several men and always keeping busy. He puts all his money in the bank, where it will be safe. Meantime, his wife, Mutti, begins to sew and hem garments, even taking in work from women who can't finish a sweater after they have begun. Before long she has quite a pile of American money, which she keeps in an old stocking of the author's. She makes enough money that she eventually needs two stockings. Though the family teases her about her mistrust of banks, her decision proves to be a wise one when all the banks in Shanghai fail after the Japanese attack Pearl Harbor. While all of this adult drama is going on, the author, who is 10 when the book begins, is growing up; and writing it all down in the 4 diaries which were given to her as gifts when the family left Germany. 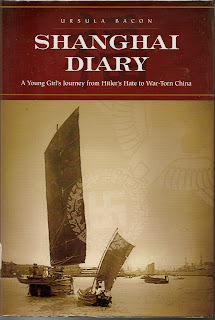 The diaries cover the years 1939- 1947, when the author was between the ages of about 9 and 17. Ms. Bacon, who was already studying English and French while in Europe, speaks English well enough to give lessons to the 3 "sisters" of General Yi, a local warlord who was fighting to retain control of his fiefdom, while at the same time attempting to repel the Japanese. The "sisters" were really concubines, and they taught the author many things that she probably shouldn't have known. And to keep up her education, her parents sent her to the best school available, a Catholic School. I told you this was an unusual book! The family did have problems though, particularly in the last years of the war, when provisions became increasingly hard to come by. The Japanese were also a constant threat as they waged war in China. For some obscure reason, perhaps dating back to the Sino-Russian War of 1900, the Japanese never really went out of their way to signal out Jews for extermination. Perhaps they were just too busy killing everyone, to signal out any one group. But somehow the family escaped most of the ravages of the war, finally emigrating to the United States in 1947. This book is a delightful surprise, concerning a usually dismal subject, but it carries a lesson. We make our own circumstances, at least to some extent. We are victims only to the depths to which we allow ourselves to be driven. This family was lucky in many regards, but still, they had to find a way to avoid falling into that despair which often accompanies the loss of home, friends and family, never to return to the place in which you were born. A very unusual book about a very unusual time and place, no picture of the Holocaust can be complete without this unique history.